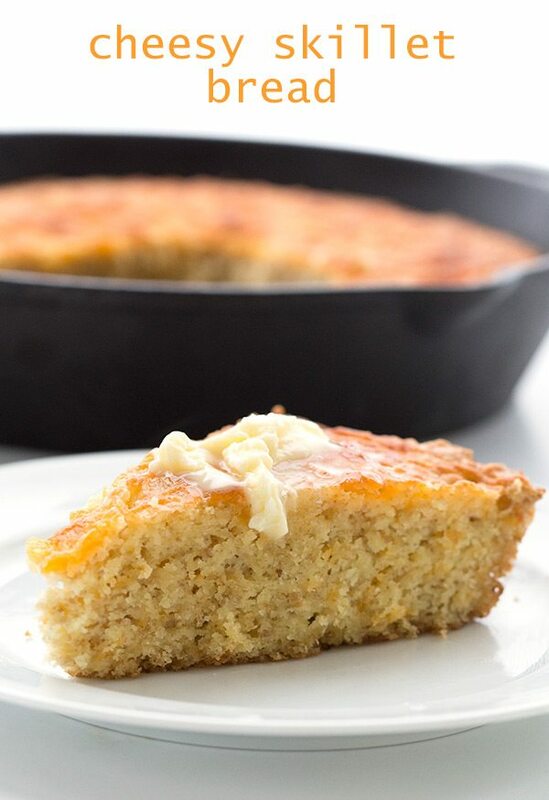 Keto bread recipes don’t get much better than this cheesy skillet bread, with its wonderfully crisp crust of cheddar cheese. This gluten-free skillet bread is perfect to serve with soups and stews, and makes the BEST low carb Thanksgiving stuffing! Check out my new how-to video. I approach skillet recipes that are baked in the oven with some trepidation, because it’s almost inevitable that someone will try to pick up the hot skillet with their bare hands. I remember in vivid detail my husband wrapping his hand around the handle of skillet I had removed from the oven only a few minutes before. It was one of those slow motion moments, where I could see him reaching for it and I couldn’t get the words out of my mouth fast enough to stop him. The single syllable “No” never seemed like such an intricate word in that millisecond of time, as my tongue and mouth tried to form it in advance of the huge mistake he was about to make. I didn’t manage it and he burned the palm of his hand quite badly. It blistered mightily and was painful for days. That was over 10 years ago and I have the whole scenario imprinted on my brain. I’ve now learned to leave the oven mitt ON the handle of the skillet once it’s removed from the oven, if only as warning to the unsuspecting soul who is simply trying to help get dinner on the table. Third degree burns aside, this cheesy skillet bread is my new go-to low carb quick bread recipe. It’s savoury, easy to make and every single member of my family loves it. The inspiration for this keto bread recipe started with one for skillet cornbread that I used to make on occasion. 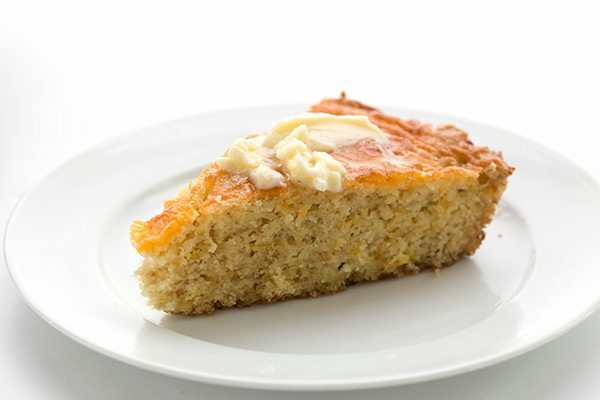 Cornbread may be gluten-free, but it is not even remotely low carb, and I was wondering if I could come up with a savoury skillet bread that would bake up in a similar fashion. It was pure gut feeling on this one, trying to get a consistency that I thought would work. I was actually worried that if I made it too moist, I would end up with a center that wouldn’t cook through. Thankfully, my fears were groundless. The keto bread recipe worked! The skillet bread baked up beautifully, and pouring the batter into a hot buttered skillet meant that it had a crispy browned crust. It was a perfect accompaniment to soup for dinner. I actually wasn’t going to post it right away but it suddenly occurred to me that it’s a perfect Thanksgiving side dish, and as I haven’t really put up many Thanksgiving recipes this year, it was time to make amends. So I made it a second time to get photos and it paired it with my low carb fish chowder. And I am already planning to make it again on Christmas Eve. I have turned this easy keto bread recipe into Thanksgiving stuffing numerous times and it always gets rave reviews. The trick is to dry the bread out very well in your oven the day before. Then proceed with the usual stuffing ingredients and bake. I really like to turn it into this low carb Spicy Cheddar and Sausage Stuffing. Many people have made this same recipe and loved it. One reader showed me photos from her Thanksgiving dinner which included my low carb stuffing as well as a conventional one. The only one that was all gone was mine! Easy low carb skillet bread with a wonderful crust of cheddar cheese. This keto bread recipe is perfect with soups and stews, and makes the BEST low carb Thanksgiving stuffing! Preheat oven to 425F. Add 1 tbsp butter to a 10-inch oven-proof skillet and place in oven. 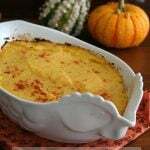 In a large bowl, whisk together almond flour, flax seed meal, baking powder, salt and 1 cup of the shredded cheddar cheese. Stir in the eggs, melted butter and almond milk until thoroughly combined. Remove hot skillet from oven (remember to put on your oven mitts), and swirl butter to coat sides. Pour batter into pan and smooth the top. Sprinkle with remaining 1/2 cup cheddar. Bake 16 to 20 minutes, or until browned around the edges and set through the middle. Cheese on top should be nicely browned. Serves 10. Each serving has 7.2 g of carbs and 4 g of fiber. Total NET CARBS = 3.2 g.
You can try using sunflower seed flour and water. Do keep in mind that sunflower seeds can turn green in baking so you need to offset this with a tbsp or two of acid, like apple cider vinegar. I see this is a very old post so not sure if anyone will even see my post but I just tried this recipe today. I didn’t have a cast iron skillet so I decided to use what I had–an Anchor Hocking glass 9×9 pan. I had to go about 5-8 minutes longer in the oven but the center set up and the cheese browned. I waited 15 mins and had a piece but I was disappointed as it was way more doughy than I had hoped. Not very airy like bread at all. I surmised that I should have used a cast iron skillet so because I really wanted to have bread that my husband and I could eat for Thanksgiving, I decided to go get a cast iron 10 inch skillet. Made the whole recipe over again and it really didn’t work much better. I guess it is SLIGHTLY less doughy but just wondering if there’s something I missed that caused it to be doughy or is that what it’s supposed to be like? I am not sure what you mean by doughy. It is moist, certainly. What brand of almond flour are you using? I don’t have a decent cast iron skillet either so I used a regular oven safe skillet. The edges cooked through but the middle was still doughy so I put it in for ten more minutes and it still seems raw in the middle. Did I do something wrong? If it seems raw, it needs more time. Your oven may run cold. It is supposed to be a very moist bread but it shouldn’t seem raw. It is more cornbread-ish than bread like. Perhaps you didn’t use blanched almond flour. Lastly, an “overproof skillet” as the recipe calls for…a skillet is the same as a frypan in shape, just a different name. They can vary in material. For instance, I used a cast iron skillet for this recipe, but I could have chosen either my aluminum/ss frypan or my carbon steel/copper frypan. Both of these pans are ovenproof, but they are different in the way they conduct and distribute heat (how fast/slow they heat up and spread the heat around). For oven use, you don’t have to worry about the second part, but the heat up/cool down part will affect your finished product. If I had used either of these pans instead of cast iron, I probably would have cooked the bread for less time (the aluminum less than the carbon steel, but only by a minute or two) and had a similar result…why use the cast iron then? Because of the nature of cast iron, it will help create that wonderful crust when you start with a hot pan and a nice even consistency and thickness throughout the rest. Phew! That was long, but I hope it helped someone here to understand a little about how and why the pan you choose will affect your end product (seriously, just look at a boxed brownie recipe sometime. There is a different cooking time for glass vs metal pans)… Happy Thanksgiving!! Just made this bread and cubed as a practice for my family Thanksgiving stuffing. Baked skillet bread as directed and cubed for stuffing. Added salt, pepper, onion powder and dried sage. Turned out better than hoped for. Tomorrow will use in a practice run in my famous sausage leek stuffing. Thank you for sharing such a terrific recipe for those of us who are watching carbs and gluten. I am so excited about this and have shared with many friends. I believe it will be perfect for my stuffing. Thank you! How did the stuffing turn out? I take that back! I thought you used a cast iron skillet! Oh! I can make this! Just make sure it’s oven proof! We do have a cast-iron skillet but it’s huge, so I don’t use it for this kind of thing. I did use my huge third-generation iron skillet and kept an eye on the bread so it wouldn’t cook too fast. Sixteen minutes nailed it. Makes this southern girl’s heart sing! Thank you Carolyn! You’re a genius. I agree with you! I was missing having cornbread with my collards! No more. I know it’s not cornbread, but it gives me the same satisfaction! This looks really good Carolyn, def will give this a try! Will you cube it and let it sit a day uncovered to get it ready as a stuffing? I think I will cube it, then dry it out the oven to help it along a bit. I made my bread last night and will dry it out this morning. Be sure to let me know how yours turns out! I hope it turns out well, I think the flavours are perfect for stuffing. It worked perfectly! I had to turn up the oven to 350 because it was taking too long but I just finished making the Parmesan, sausage, artichoke stuffing with this bread and oh my god is it good! Thanks for the great idea! Awesome! My bread dried out nicely at 175 for about 3 hours so I am psyched to put it all together tomorrow. HA HA! I did that on Friday! Because I’m a moron. I took the skillet out of the oven with an oven mitt, put it on the countertop, and then not even 2 minutes later, returned to the skillet to move it and grabbed the handle with my bare hand. I mean, it’s one thing if you grab it after someone else has removed it from the oven, but *I* was the one who did it–there’s really no excuse for that. Anyway! This looks spectacular. You had me at cheesy. The bread looks delicious! After my husband burned his hand on our iron skillet I bought a Silicone Hot Handle Holder and always put it on the handle as soon as the skillet comes out of the oven. I store it on the skillet in the cabinet so I won’t forget it. So east to forget the handle is still hot! I leave a hot pad on the handle as a reminder. This looks perfect! Love how cheesy it is! That is some heavenly looking bread! oh my gosh this looks amazing!! So cheesy and delicious! Definitely going to make this this week. I only use unsweetened almond milk – should I compensate with a sweetener at all? And I’ll probably add back the bacon and jalepenos because I love both. What do you think about bacon grease in the pan instead of butter? No, no sweetener. I only used unsweetened almond milk too. And yes to the bacon grease! I’ve never made skillet bread, but would love to give this a try – I bet it was good with your fish chowder! BTW, I’m making your pumpkin parfaits and chipotle lime cranberry sauce for Thanksgiving. Can’t wait. So carby! That’s fantastic and high praise indeed! Smart idea to leave the oven mitt on, I’ve burned myself one too many times forgetting that the handle was hot! I’m chuckling. Last night I reheated something in a cast iron skillet in the oven, set it out on the stovetop and went about getting the rest of supper ready for everyone to dig in. Although I’d warned everyone else that it’d just come out of the oven and to be careful… Somehow I ended up with a fantastic burn on my lower palm from its handle. Chuckling…and perhaps crying at the same time? Those skillets need handles that burn red or something to let us know not to touch! Kitchen miracle: White vinegar. If you burn yourself, imediately pour some vinegar on it and it will help to keep the burn from blistering. It actually works. If the burn is bad, soak a papertowel with the vinegar and keep on the burn. Good info on the white vinegar. This looks so awesome, I have to try it!!!! Oh wow, that looks so great!!! I bet it is super tasty! I love this recipe Carolyn. It looks so comforting. I bought a cast iron skillet handle cover for mine. I found them in a small Mennonite village we frequent in summer. They work great cuz we all do the same thing. It’s so easy to reach out and grab the handle. 11 cups of cheese? Whoa, that’s some cheesy bread. No…that’s one and one half cups of cheese. Thanks! This looks soooo good! I’ve never made skillet bread before and now I’m really tempted to try to make some. This looks just great, and I’d love to try it. Just one little problem: anything salty I ever baked from almond flour has a strong marzipan-taste. Any almond flour I could get here in Germany (and there are many different options) is great for sweet things, but salty things made from it taste really weird. Is there a trick or an ingredient to get rid of this marzipan-flavour? Wow. That never happens to me at all. Is the almond flour sweetened? You know what I suggest for this recipe? Get a bag of almonds and grind them up as finely as you can yourself (without making them almond butter!). This recipe doesn’t require a fine texture, so that should would fairly well. No, it’s not sweetened. All nut flours here are “cold pressed” without adding anything. 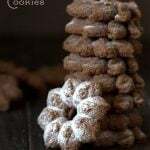 We can also buy ground almonds, which are regularly used for cookies. I used them already once for a bread, and you are right -there is no marzipan-taste. But the amount of calories is extreme: 100 grams of ground almonds = 650 calories, 100 grams of almond flour = 250 calories. You see, it makes a big difference, and I could use it once in a while, but I don’t want to use it for any bread, pizza and whatever salty stuff. So I hoped, there is a trick, since you use almond flour a lot. The secret to American almond flour, I think, is that it’s not pressed at all. It’s just really, REALLY finely ground almonds. I’m not someone who worries about calories…the more filling the item, the less of it you eat. I suspect your “almond flour” in Europe has had much of the fat pressed out of it. Which is why it’s light on calories. And, in my humble opinion, light on healthy fats and nutrients! Ok, now I understand. When you write “almond flour” you mean ground almonds. Here this is two different things. Ground almonds are sold in every supermarket in little 100 grams portions. It’s rather fluffy and everyone uses it for cookies. Almond flour is difficult to get. Usually you find it in shops with organic food or in health food stores. It’s as heavy as regular flour and looks about the same. Since it’s cold pressed, there is only 10-12% fat left, but – according to what they say – the flour still includes all essential fatty acids and nutrients. Since I tend to eat too much, when I really like the taste (no matter if it’s filling), I need to keep an eye on the total amount of calories. I guess a compromise will do: ground almonds for salty things and almond flour for sweet things. Thanks a lot for your help. I’m still amazed about all those wonderful recipes and tried already quite a few (transforming all those “cups” into grams is not so easy though 😉 ). I just made this last night and it was AMAAAAAAAAAZING!! Looks yummy. But, unfortunately I don’t have a regular sized oven– just a stand-alone convection oven that wouldn’t remotely hold my cast iron skillet. Do you have any idea how to pull this off with different equipment that could fit in my oven? Do you have an 8 inch round cake pan? That would work. Do the same thing with the butter, melting it in the pan, and be sure to swish it around so it goes up the sides before you add the batter. Then watch it a little more closely…it may cook a bit faster or slower, I am not sure. Yeah, I don’t like to buy special equipment either, unless I know I will use it a lot. Keep your eye on the bread, it may bake more quickly in a thinner pan like this. I do have a cake pan, but then you have to be really careful heating it up on the stove to melt the butter– without a handle at all. I’ll try it. Thanks. This was A-M-A-Z-I-N-G! I made it for brekkie, and ate it alongside some chicken sausages! I did use einkorn flour instead of flax, and also subbed heavy cream for the almond milk! So, so, good! Can’t express that enough. Made it in our medium cast iron! Waaaahhhhh!! My husband and son didn’t like it. I baked mine in a cast iron skillet. It didn’t look done in the center so I baked it about 7 minutes longer. Still kind of mushy in the center. I had a piece for breakfast this morning and warmed it in the microwave and I liked it. I did put it in myfitnesspal and was shocked at the calorie coune which is about 325 calories fo 1/10 and I had alittle more than that. I try to eat low carb and low sugar, but I do like to track what I eat in myfitnesspal and I still can’t let go of the “calories in calories out” philosophy to lose weight. Its scary to eat stuff with this much fat and calories. I’ll keep trying to have an open mind though. You have so many great recipes that I want to try. Hi Pattie…I think your oven temp might be off, if it took that long to cook…next time, I’d up the temp by 25 degrees or so. Sorry your husband and son didn’t like it. Just a hint on avoiding burns from a hot skillet handle. You can buy pan handle holders (like pot holders, but designed to slip onto and cover a pan handle) and leave it on while the pan is cooling. Alternatively, drape a dry dish towel over the handle for safety and/or a visual reminder. Yes! My silicone handle sleeve has saved countless burns. I store it on my cast iron skillet handle, take it off for cooking, and place it back on the handle immediately after removing from the oven – before I take off my oven mitts. I found this recipe on Pinterest and it is amazing!!! I’ve cooked it twice. Once just like your recipe and then last night I made it and added taco meat. All I can say is OMG, it was delicious!!!! So…I made this again tonight but altered it to be a desert. Left out the cheese and added a box of cream cheese, 1/2 cup splenda, a little vanilla, and some blackberries. Topped off with Carb Smart vanilla ice cream and it was amazing. Forgot to mention, I had to cook it about 6 min longer. What size bix of cream cheese? 3 or 8 oz? All were successful. Next time, add chopped jalapenos for a Mexican twist. Can you freeze the bread? I know myself, if I like it and it’s not put away securely after had some, I’ll be eating way too much of it! Yes, I think you could probably freeze it. I’m a single female and live alone. (I like it that way. Doesn’t mean I don’t date! 😉😉) I’ve made several skillet cornbreads using a cast iron skillet. I think that’s a must! Back to being single…after baking it’s way too much for a single person. I divide it into quarters. Wrap each quarter in Saran Wrap then foil and put them in the freezer. Take them out of the freezer as I need or want to eat it. Toast it in my toaster oven and slather with butter! Mmmm mmmm mm! Just tried this recipe and used coconut oil instead of butter and it looks and tastes declicious. 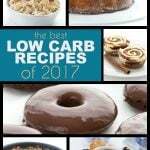 Can’t wait to try other low carb recipes. God bless! I modified it (due to limited ingredients) and it turned out great. I used 1 cup hazlenut flour and 1 cup homemade Atkins (I think it was almond flour and soy flour mixed), and used whipping cream (since my almond coconut milk went into soup). Texture very much like oven cornbread. I think if I made this for company, I might even add a very small amount of creamed corn. Made this today. It was wonderful. I made half a recipe in case I didn’t like it. I used the amount of baking powder called for, but I used buttermilk and 1/4 tsp of soda instead of the almond milk. It was really good. Will definitely make this again. Made this today. It was wonderful. I made half a recipe in case I didn’t like it. I used the amount of baking powder called for, but I used buttermilk and 1/4 tsp of soda instead of the almond milk. It was really good. I’m a southern girl and we like our buttermilk. Will definitely make this again. Just wanted to let everyone know that it still turns out if you accidentally put twice the amount of melted butter in! Oops! I’m still not used to measuring butter in terms of ‘cups’ (I’m a ‘tablespoons’ girls), but those pesky–wonderfully pesky–Kerrygold bars threw me off again! haha Next time I think I’ll add some garlic powder or a little bit of cayenne. Hey, I love Kerrygold! I say 2x as much butter is better. Glad it still worked out! I just baked this in order to make your stuffing recipe and it is incredible! I want to eat it instead of cubing it and drying it out in the oven! I try lots of low carb recipes from the internet and yours are consistently my favorites. Thank you so much for making eating healthy very tasty! Just made a batch to make into stuffing and….you guessed it, burned my hand on the pan. Ha! That’s what I get for too much multi-tasking. Delicious though. I can’t believe how much it tastes like southern cornbread. Yikes, Amanda….sorry to hear you burned your hand! You inspire me!!! Thank you so much for all your wonderful contributions. I love cooking and following your blog keeps it exciting! I am making your skillet bread and tweaking it to see if I can get a “cornbread” dressing. So far so good. At least it smells yummy! I love this cheesy skillet bread. It is just the right touch with any meal. Happy Thanksgiving! It really is wonderful skillet bread. I can’t wait to try the final dressing tomorrow. I love your blog and your amazing creative recipes. My husband and I converted to a low-carb diet since traditional low-fat diets just made us miserable and didn’t work for us. Your website has been an amazing beacon in the dark. Just when I thought I had to give up delicious baked goods forever, I found your blog. And every recipe is fantastic. I can’t thank you enough! Thanks, Amanda. And what does it say about me that I read it as “bacon in the dark”. Um, maybe I am obsessed with bacon!?? Thanks, Melanie! Happy Thanksgiving to you too! What tweaks did you make and how did your dressing turn out? I see a lot of comments abit stuffing but I want to make dressing too. I couldnt wait to make this and told all my friends! I had to change it due to not having the exact ingredients on hand but I got close. I had to use coconut instead of almond flour and heavy cream instead of almont milk. Now this made it more like a thick dough and there would be no pouring it into a pan. Not wanting dry bread I added about a cup of chicken broth until it was more like normal cornbread batter maybe a little thicker. Spread it out in my hot skillet and dashed salt pepper and Texas Pete on top before adding the cheese on the top. I cooked at 425 for around 25 minutes and it was perfect. Like real bread! I loved it amd so did my new to low carb husband. Thank you!!!!! Is there anything you could recommend substituting for the flax meal? I used ground chia seed and it worked perfectly. This skillet bread is amazing! Ohmygoodness!!!! I made your pan bread today. 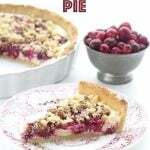 Although the flavour was a huge hit – it came out very crumbly and fell apart when it was cut. Any ideas of what might cause this texture problem? Hi Liz – between the flax, the eggs and the butter, it should not be crumbly. Did you change the amounts at all? I made this last night in my cornbread cast iron pan. It was wonderful! I am so glad to have found a recipe for what I think tastes a whole lot like cornbread. I didn’t have almond milk so I did use cream and water with some apple cider vinegar to make a buttermilk taste. Fantastic. Thank you! Okay, I LOVE the idea of the vinegar to give it the sour-y buttermilk taste. I am going to try that next time! Could you mention how much cream, water and apple cider vinegar you used. That is a good idea. Your recipe sounds great!! However, I don’t have an oven-proof skillet. Do you know if I could use a 9-inch pyrex glass pie plate instead? And have you tried this recipe using other cheeses, such as gruyere, mozzarella, etc? I think it would be fine in a glass dish – the baking time may change a little so use your judgement for doneness. And I am sure it would be fab with other cheeses! I made this yesterday with a glass dish and it worked perfectly!! I just baked if for about 7 minutes longer. The consistency was great, sort of like cornbread. I loved it but my boyfriend said it wasn’t cheesy enough, I might try adding more cheese next time. I made this and it was delicious. It tasted even better the next day 🙂 Real cornbread texture. Great taste (not cheesy enough for me 🙂 ). I bought some corn flavor extract to try (my aunt used to make it with creamed corn). Took some to a friend who refrigerated it for a day or two, then called me and said “the bread? It was delicious. When are you going to make some more? !” I told her I would giver her the recipe AND the link. Another winner Carolyn. Thank you. Hi. My daughter is allergic to nuts. If I used flax meal and coconut flour and/or oat flour what would my measurements be? I really can’t say for sure, because I haven’t tried it myself with coconut flour. It’s a very different beast and I think it won’t bake up very well in this format. You could do 2/3 cup coconut flour but you are going to need to increase the eggs, probably to 5 at least. I’d say that a better suggestion is to do something like ground sunflower seeds for the almond flour. I just made the bread this evening. I am new to low carb/gluten free. It was better than expected. I am going to use the rest for the sausage stuffing tomorrow. How can I find out the complete nutritional information for both the Cheesy skillet bread and the Spicy cheddar and sausage stuffing? I think you might have to enter the ingredients for the skillet bread into an online nutritional calculator like My Fitness Pal. I used to do these calculations by hand for the carbs. I now have software but no time to go back to old recipes to fix it! Thanks! I have chia seed but not chia seed meal. Can I just use chia seed?And would the amount be the same? This recipe actually takes flax seed meal, not chia. It would be very different with chia. I make this fairly often now, sometimes in a skillet, and sometimes in a muffin pan. Either way, this is a lovely bread-like accompaniment to dinner or lunch. Today, at this moment, with my lunch, I am enjoying a slice of skillet bread split in two and toasted, with butter, a bit of dijon mustard, and a slice of cheddar! It’s about as close to a toasted cheese sandwich as possible in an office kitchenette. Just a note about burns…I found an awesome way to “heal” that wound in about 6 hours! I also burned my hand and I am a massage therapist so I would be out of work until it healed. I researched on the internet and found that if you wet the burn right after (run under cool water) then pour table salt and wrap it with the salt on it, the burn will NOT blister and will be completely gone in 6 hours! The only thing that was left was a white spot on my hand and it eventually peeled off. Absolutely NO PAIN!!!! Wow! Very good to know. LOVED this! It was very moist, but delish. May bake a bit longer, Added some carmelized onions. Next day, still moist, so sliced and broiled it on each side, then let the pan sit in oven to dry it a bit. OH MY! Like savory biscotti! Making again for a snack. May try it cold with a bruschetta topping. Also trying a sweet version with cinnamon. Love it as bread or biscotti. Definite keeper! Glad you liked it and all of your ideas on how to serve it! I can’t stop making this. I forgot how much I missed cornbread. Made this tonight – wow fantastic! It was crispy but soft yummmm! Thanks for all the suggestions above and all your inspiring recipes. I plan to make this without the cheese, allow it to dry out and use it as breadcrumbs, my children have missed breaded fish. Great idea on the fish! I was wondering…can you bake this in an 8×8 glass baking dish instead of a skillet? Yes, that should would. It probably won’t get as crispy around the edges. Hi!! Does anyone know if this bread freezes well? I just made this for stuffing (I’m cooking my Thanksgiving dinner today) Unfortunately, I didn’t follow the stuffing directions on this bread and hoping what I just made today will hold up in my stuffing. So far though, I found that this bread tastes really good! Any idea on calories per serving? Loved this! Made this over the Xmas period and had to make a second batch – the first batch didn’t even make it to the table! Fantastic alternative to garlic bread, although may even add this next time. Just a thought…..I have been looking for a savoury pie topping with a texture similar to a suet crust……do you think this could be adapted? I don’t know what a suet crust is like (I know what suet is, but not sure what a crust is like made with it). Glad you liked it. It also makes great stuffing if you cube it and dry it out in the oven for a few hours. Thanks for posting this recipe. I’m trying to figure out whether I made an error when cooking it, though. Your recipe says to “pour the batter”. First, when I combined all the ingredients, I did not have a pourable batter. It was very dry and clumpy. Is the consistency supposed to be like dough or more like a pancake batter? It’s entirely possible I just messed up, but I wanted to confirm before I try it again. The flavor was great, but the end result was brutally dry. “Pour” may be a “poor” choice of words. It’s thick, but not like dough, more like between batter and dough. You typically have to spread it in the pan. But it should not be “brutally dry”. I think either you measure something wrong, or you were using almond meal, not almond flour. I don’t use almond milk. The only “dairy” I use is heavy whipping cream in my coffee. Is there something I could substitute? I’ve never cooked with almond flour before, how do you measure it. Is it lightly sifted, lightly packed or tightly packed? By volume would be easier for me. I simply scoop and level. No packing. I’ve never tried but I can’t see why not! I don’t have an oven safe skillet. Would a pie dish work ok? Do half whipping cream half water. I think I made a mistake!?? How are you supposed to cool the bread? In pan or out of it? I tried turning it upside down over cooling rack fresh out of the oven and it fell apart pretty badly. Assuming I was supposed to wait for 15 min and then remove? Upside down or in wedges? I am trying to make the stuffing that uses this recipe and hope that the “cubing” instructions for drying are not essential to still being able to use this? You simply let it cool in the pan and cut wedges right out of that. Your stuffing should be fine, though. Thanks, Carolyn. I appreciated the quick response. Lesson learned and onto the stuffing! I have made this in connection with the stuffing you have it a recipe with. Looking forward to making this just for a meal. What can I use instead of almond flour? My husband is allergic to almonds. Hi Carolyn! This looks so amazing! I want to make this recipe ~4 days before I serve it (due to time constraints:) ). Would you recommend freezing it in the meantime? And do you have any tips on the best way to reheat it in the microwave? I’ve never frozen this, I’m afraid. If you can, I wouldn’t reheat in a microwave but instead in a toaster oven or big oven. Thank you so much for this recipe! Found it on Pinterest, made it tonight and it was a hit! I actually halved the recipe and made the bread in to a deep dish pizza crust – it was amazing!! It will definitely be a staple in our house now! Best low carb bread I have made. THANK YOU! It really is incredibly delicious. I may have a hard time not eating the whole thing in one evening. Is there a sub for the flax meal? I don’t care for flax or chia, too slimy. It’s not slimy in this but you can sub more almond flour. Thank you. That was going to be my question, as well. Would you say 1/2 c of additional almond flour? Oh I made this tonight and it was incredible! Instead of melting the TBSP of butter in my skillet I used Fatworks Beef Tallow but then used butter in the recipe. Sooo moist and delicious – I finished my kids pieces and husbands – ha! You can make it and it can sit out for a few days. I make some and we have it one night with soup and then it sits on the counter (covered with foil) for a day or two. Not sure why, but the mixture seemed really dry before I put it into the oven, checked all my measurements and they seem right, the only difference is, I used coconut flour instead of almond, I did add more coconut milk to make it more manageable, do you think the finished product will be ruined? Yup. Sadly, I do think it will be awful. You cannot replace almond flour with coconut flour directly. You should have used only about 1/3 the amount and a few more eggs. They just don’t translate well to each other. Well I used coconut flour, and just like you said, it was awful, dry crumbly …a mess, however I do think I can salvage it for the stuffing! I might just add more butter to make it moist, what do you think? 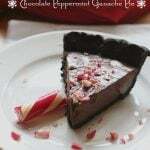 Hope you will see this post from a 2012 recipe ? I would like to know if I sub THM flour for the almond flour would that work? If so what amount would I use?? Thanks for all your great recipes! I think it will be much drier. You probably want to use a little less, like 2/3 the amount. Ok thank you very much for the reply! Have a wonderful Thanksgiving! OH MY — this is fabulous!! I used bacon drippings melted in my skillet instead of butter as a tribute to my old cornbread days — wow, this is just SO good! I saw that you recommended replacing almond milk with water on someone else’s comment. I was wondering if replacing it with heavy cream would work? I just don’t want to buy an entire carton of almond milk since I don’t use it for anything else and the recipe only calls for 3/4 cup. I can buy heavy cream in a small carton. Or is water the best substitute? Also is there a replacement for flaxseed meal? I’m not sure they have it at my grocery store. Heavy cream is thick and makes the batter thick but you can always do a mix of cream and water. Or just water. For the flax seed, just swap in more almond flour. Emily, I don’t use almond milk so I asked about using heavy cream. The response was to use half cream, half water. Thanks! 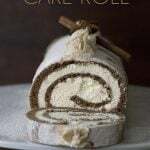 I will be making it this weekend and let you know how it turns out. To make it garlicky would I just put garlic salt instead of regular salt? Could I use real crushed garlic in the batter? So could you just use Half and Half then? It’s not as thick as heavy cream and thicker than water. I made it yesterday but I wasn’t sure if any of my skillets could go in the oven (couldn’t tell if the handles were plastic or metal) so I used a glass baking pan instead. I thought it wouldn’t matter much but apparently that was not okay. Checked after 15 minutes and it was still goopy. Left it in and kept checking on it every few minutes, then forgot about it for a while so I have no clue how long it actually cooked. When I remembered it was in the oven, it was definitely cooked through. I have not tried it yet since I made it for lunches this week. 1. If you do not have an oven proof skillet, should you just not make this recipe or is there a different cooking tempt & time you could recommend for using a glass pan? 2. After it’s cooked, does it need to be refrigerated? Can it be reheated in the microwave? I’ve never made it in a glass pan. I suppose it depends on what size and shape. And I leave it on my counter for a few days, wrapped in tinfoil. It can be reheated nicely. I’m not sure what size it was, but it was a small square glass baking dish. Probably 8×8 or 9×9. If I decide to make this again using a skillet, does it matter if it’s cast iron or not? I was recently given a cast iron pan and have never used it so I don’t know how that affects cooking temp and time. Hi, Carolyn! This looks great. Do you think a little corn extract would make it taste a little more like cornbread for the stuffing, or would that be incompatible with the other ingredients, ‘taste-wise’? I purchased your best seller cookbook, had it spiral bound so it is easier to keep it open when using it. Thanks again for the delicious recipes. I was wondering, do you have a substitute for lipton dry onion soup mix? It needs to be gluten free as we have a couple family members who are intolerant. Thank you so much for this recipe! This bread is delicious. I had to use a glass casserole dish to make it, and it took 10 extra minutes to bake. I also had to use duck eggs, and I used two big ones in place of three large chicken eggs. This recipe has given me a base for other breads, one of which I will probably make when my cheesy bread is gone. Thank you so much for this recipe, it looks great! I am a little concerned about using flaxseed meal since learning it has phytoestrogens. I worry with a history of cancer on my mother’s side what this may do, so any suggestions for subbing for the flaxseed meal? Just do more almond flour. I was so pleased with this bread!! I used a glass 8×8 baking dish and the bread turned out beautiful and super yummy. 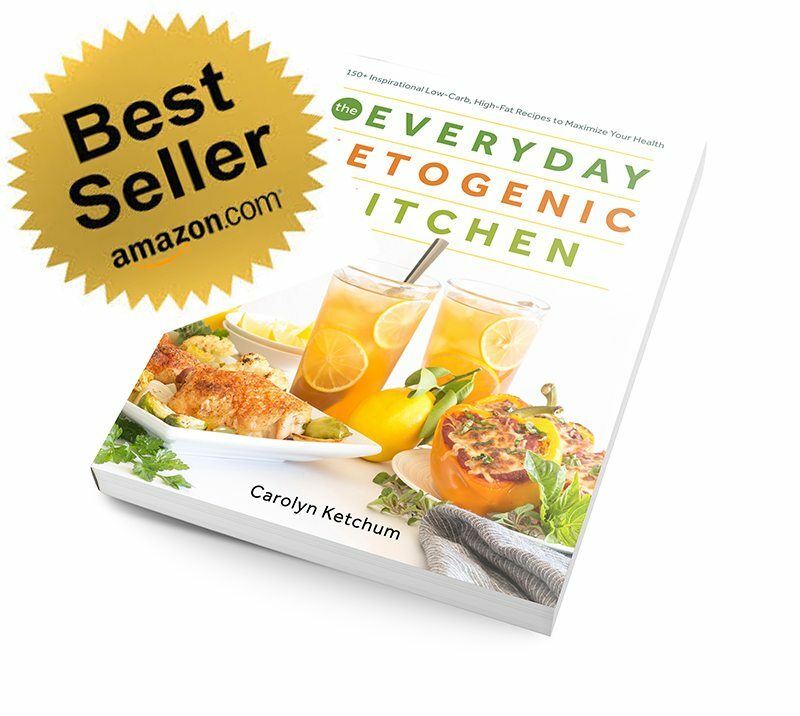 I have tried several of your recipes, Carolyn, and have loved every single one. They are easy to follow, and turn out like the pictures you post…which never happens for me! Thank you so much for making the low carb lifestyle so delicious. That might make a difference. I’ve never baked at elevation s I can’t be sure. Thanks for a great recipe! We’ve tried it and it’s been delicious every time. I was wondering if you know if this recipe will work if I omit the cheese? It will work, as the cheese is not integral to the consistency. I just made some killer chili in my instant pot and I popped online to search for a low carb cornbread recipe to serve with it. I have to tell you, time and time again when I search recipes, I look at several different ones and 9 out of 10 times (maybe more, lol) I end up using YOURS! I made this recipe for my diabetic friends who don’t make yummy things for themselves. Delicious recipe. Add Amoretti Corn Flavoring and crushed bacon rid and it turns into cornbread! Carolyn I love this recipe! I’ve made it several times already and also made stuffing with it. Can I omit the cheese and add swerve if I wanted to make a sweet cornbread? Sure…someone just commented that they did that! Just wanted to say Thank You! I made this in hopes of giving me a replacement for Thanksgiving chicken and dressing and it was amazing! Used it just like I would regular cornbread and even some of the hardest critics gave it a thumbs up! 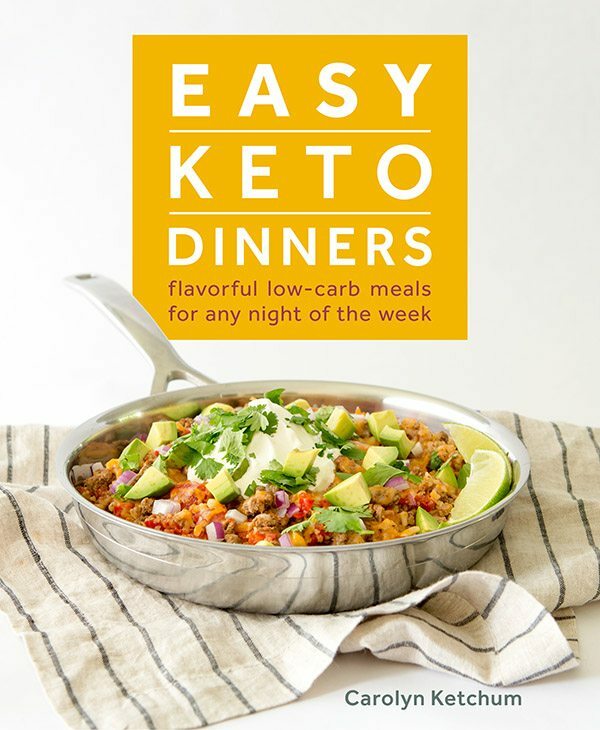 I am relatively new to the low carb – Keto world and this helped me stick to my plan! I made this in a cast iron skillet for Thanksgiving, and it came out great. It tasted like cornbread (yay) according to my cornbread loving brother and there wasn’t any leftover. I used bacon grease for heating up the skillet instead of butter. Best bread by far! Thank you Carolyn! I just made it for the first time this week and not only did it come out awesome but toasting it the next day is wow! I have been low carb & grain free for 3 yrs now and I have to say this was the easiest bread I have made. I am going to give it a try in a loaf pan too. I don’t have a cast iron skillet, can I use a 8×8 baking pan or glass 8×8 pan? That should do. Go with the glass. It won’t be as crispy and may take a bit longer to bake. It was amazing!! This will be my go to bread on weekends! Family loved it. Thank you! ?? OMG!!!! I just made this and it came out AaaaamaaaaaazING! Some adjustments were needed. I used 1 cup Pecorino Romano cheese, and none on the top. No salt as the cheese is salty. Baked for 16 minutes at 425, middle was not cooked. Reduced heat to 175 for 10 minutes, turned off the heat and left in for 10 minutes more and PERFECTION!!!!! I am thinking 350 degrees for 35 to 40 minutes may be a better fit. This is delicious! Had to make another batch for stuffing today, and I don’t know if it will make it there… too yum! Merry Christmas Carolyn to you and yours. I just made this for lunch today and my husband and I both loved it! Two things I did differently: added about 1T of corn flavoring, and a few drops of EZ-sweet sweetener. It made it taste a little more like corn bread. We love the crispy crust from the butter in the skillet. We had it for lunch with a low carb tomato basil soup – YUM! Wonderful recipe, have bread to eat again! as I do not have a skillet, I used a heavy porcelain baking dish, 9 1/2″ square, got it up to the high oven temperature and put in the mixture. Baked perfectly in about 12 minutes, and was cooked all the way through. Am enjoying it with everything and toasts beautifully when cut horizontally to produce a bread-sized slice. I went with water, rather than almond milk and it turned out pretty well. A smidge moist; I didn’t want to cook it any longer due to being crispy around the edges. VERY filling with a small bowl of chili. We’re both pleased with it and will make it again. Next time without the cheese on top, I want to try just a basic batter bread like that with butter. Was my side of choice at last thanksgiving, naively thought I will have leftovers…Everybody ate and ate even the ones on standard american diets. I was scared about the flax seed meal but the final texture was amazing, great source of fiber so needed on a keto diet. A new stapler. LOVE IT! So so yummy! Love this. We add the liquid from a can of organic corn to add to the ‘corn’bread taste. 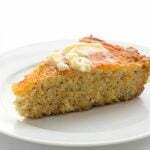 We have tried some other low carb/Keto cornbreads and none of them stack up to this one. 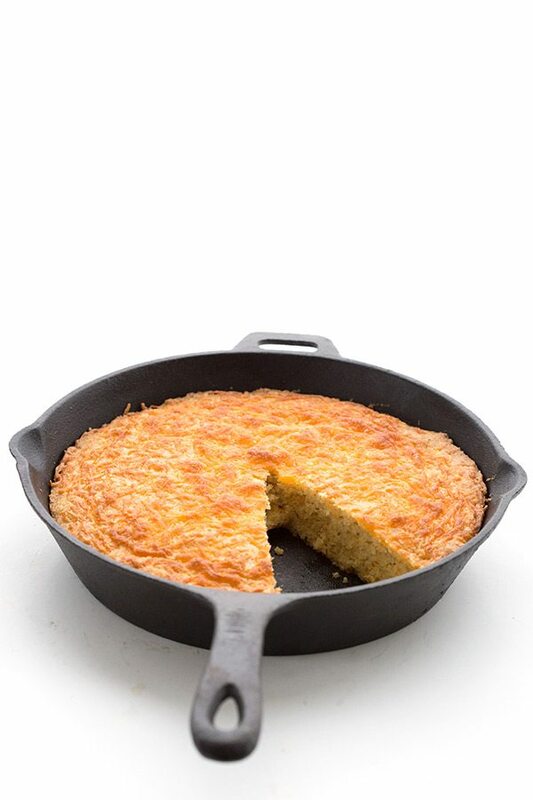 The consistency and taste are so close to the cornbread we have grown up eating. 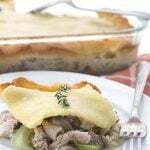 I make this every year For Thanksgiving and it is always a big hit! Also, these croutons are amazing on French Onion soup. Can you use dairy milk or heavy cream instead of almond milk? Really, really good and easy to make! 10 out of 10 Carolyn. It even made a quite ordinary soup that I had for dinner last night taste absolutely delicious! Thanks, Lynda! We love this one too. Topped it with avocado, tomato and basil and it was devine! 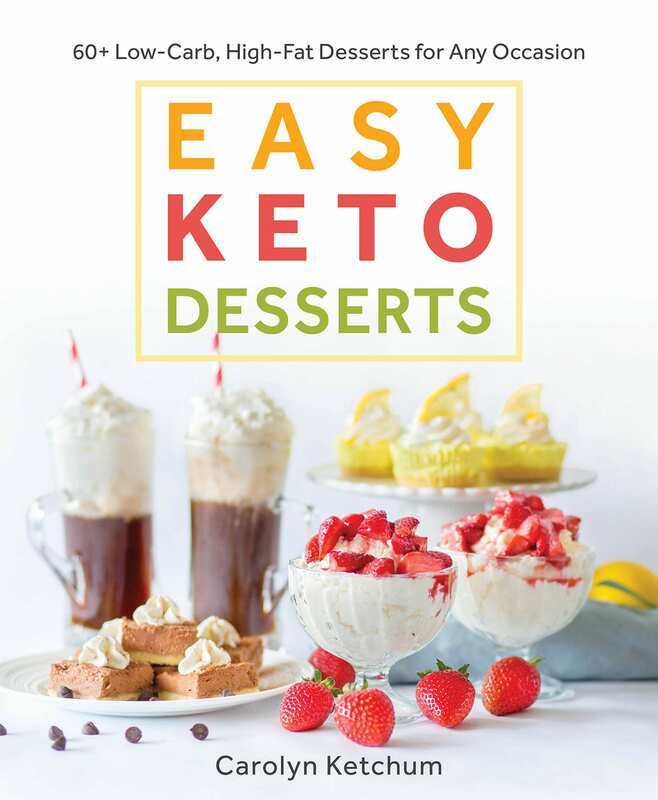 Thank you for so many wonderful recipes, it will make keto life a lot easier! Hi Carolyn, love your recipes. Just made this skillet cheese bread in order to make the stuffing for our Canadian Thanksgiving celebration this weekend. Just had a tiny skiver still warm from the oven and it is delicious, nice crispy crust on the bottom and the texture is very reminisce t of cornbread. Am looking forward to using in your stuffing recipe. Iam going to use diced fennel instead of celery. I also used shredded goida instead of cheddar in the bread as that is what I had. I can see adding some thinly slice jalapeno to decorate this on top as well to go with keto chili in the future. I don’t have flax seed meal. What can I substitute or can I leave it out? Do you add equal parts almond flour to sub for the flax seed mea!? 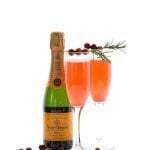 I love this recipe and have used it for Thanksgiving dressing for several years. This year I was thinking about making it using a Muffin tin, but after scanning all the replies I don’t see any suggestions on baking time changes. 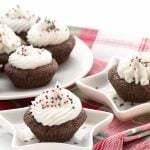 Can you offer any guidance about baking as muffins? Besides automatic portion control, I think it will make it so much easier to freeze and just pull out what you need. I think baking would be much the same but butter those tins well and watch them. Give them 20 minutes and then check on them every 5 minutes or so after that. I have a crazy question… do you think you can substitute out the eggs for flax eggs? or would that ruin the whole recipe? I have an allergy to eggs and miss bread soo much! I honestly haven’t tried the bread or the stuffing without eggs. It may be much more dense but… I say go for it and I think enjoy something at least somewhat similar to stuffing. Have you tried doing gelatin eggs? Do you have a version of this recipe without the cheese? Our traditional stuffing recipe is the old Betty Crocker sausage stuffing, which doesn’t have cheese. I’d like to get as close to that recipe as possible, but, of course, have it keto and gluten-free. Thanks! You can simply make this without the cheese! 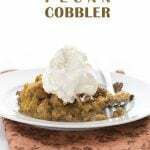 this recipe looks great and would like to try it with the stuffing recipe but i do not own a 10 inch skillet. could i possibly use a 10 in glass dish or an 8 in dutch oven? Any sort of baking pan is fine. I never said I didn’t use one. I always use a cast iron skillet for this recipe. But you can do it in a baking pan if you prefer. Wow!!! New fave Keto bread. Made 2 loaves over past 3 days. It’s fluffy, crunchy exterior, and tastes wonderful! I’m making next batch with jalapeños in the mix. Thanks. I think this question has been asked to death but just to clarify, is it ok to use glass or just about any other type of baking pan? Maybe even a more shallow one and adjust the cooking time? 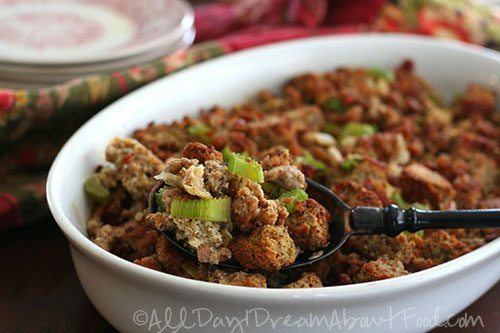 Can’t wait to try this as sausage stuffing is my Favorite and thought I might have to do without this year! totally fine but the baking time may be a bit different. Keep your eye on it. Ha, just read through all the comments and finally towards the bottom my question about omitting the cheese was asked and answered! Can’t wait to try this for dinner Saturday night and then also for stuffing for Thanksgiving, but my sister-in-law is eating dairy free right now. Where has this been all my low carb life! ! YUM! I made it with about 1/3 more ingredients for a 12″ skillet and it was awesome. I have to stop myself eating it all because I need 1/2 for Thanksgiving. Going to surprise my Southern hubby with some tonight ! ! I hope he loves it as much as I do! Thank You for creating this! You can dry it out ahead of time. You can also just cube it and let it sit for a few days to dry out. Came to this through the Sausage Stuffing recipe for T-day and decided to try it. Amazing!! 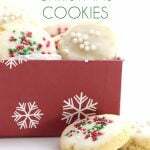 So delicious I may have to make another batch because this one might disappear before I can get to the stuffing! Truly yummy! Thank you! Yes! me too! And when I first tried it I gave it a 4 star, after it had cooled a little longer I was wishing I could have updated it to 5! hubby (who isn’t keto or even low carb) agreed this would be a repeat recipe! This bread was awesome and so easy. It baked while my chili cooked and the meal came together so easily. I baked it a few days before Thanksgiving to see if it would be good for my stuffing and it hit the mark! Will be making this often. Thanks for this!!! I just made this today, 2 days after Thanksgiving, 2018: I didn’t have more than a tablespoon of conventional stuffing/dressing, and I was feeling a little deprived (although I made the bread only and not the stuffing, but 1/2 of the bread may end up being stuffing!. Worked beautifully. 10 “ cast iron skillet, etc, as directed—and did the batter bubble up in the hot buttered pan! My Only change was to use oat fiber rather than the flax (and less than the 1/2 cup—-maybe a 1/3 cup. I did use a Mexican blend cheese. Next time I would use less salt. I checked at 16 min, then cooked 5 min more just to make sure re the middle. I was concerned it might be too dry because of the oat fiber. I like using some oat fiber along with almond flour: a nice texture. But all in all a KEEPER. THANK YOU once again. Made again a few different ways. Muffin style, mini bread cakes. Just had to shorten cooking times. Yummy. Did add jalapeños and jalapeño pepper jack cheese. Added onions too. So good!! Crisped some with garlic butter for garlic toast. Yum yum. I found this recipe one week before Thanksgiving and knew I would never go without dressing at Thanksgiving again -since I’m doing Keto now for almost a year. This was without a doubt —fantastic —and everyone wanted the recipe. I was prepared and texted the link to your website! It was the best thing I could have taken to the dinner and I wanted you to know how much I appreciate your genius! That cheesy skillet bread has been made four times since I found the recipe and is obviously a new regular in the dinner rotation! Thanks, Ayn! I really appreciate your support. Can I substitute heavy cream for the almond milk? You need half cream, half water. All heavy cream will make it too thick. I’ve been reading your most excellent blog for years but never tried once to bake with almond flour–some kind of mental block I suppose. I made this bread as my first foray into low carb baking and it works! It really really works! I was worried others in my household might not give it a fair try if they knew it was almond flour so I told them it was a sort of cheesy skillet bread (oh, it was also my first use of a cast iron skillet so that was my cover story). The family liked it very much and said it tasted sort of like a quiche, or an “egg bread.” I didn’t have almond milk so I used half and half and the texture seems to still be just right. 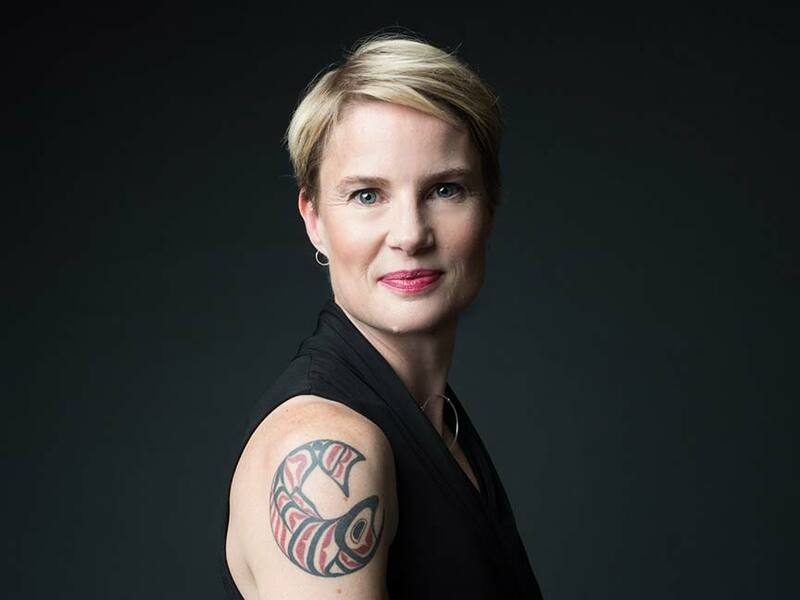 Now I have a confession to make: I am in the sorry position of needing to eat low carb, forever, for my health–and I also have never been able to stand the taste of eggs. How sad is that?? Standard baked goods may be made with an egg or two in a recipe with many cups of flour, and I don’t taste the eggs in that case. But low carb tends to rely highly on eggs for various reasons, so I have to figure out some ways around that. I would like to try making this bread with just one egg and some other ingredients to take the place of the other two eggs and would welcome any suggestions. Thank you for this blog, it’s by far my favorite source of low carb recipe ideas and I hope you know that you are literally helping to save lives with your work. It’s weird that this was so eggy for you because it’s really not or it shouldn’t be. I am wondering if your eggs were larger than normal? Egg free baking is hard with low carb ingredients but you could reduce the eggs and have it be more firm and less fluffy. Asked for a cast iron skillet for Christmas especially for this recipe and I’m happy to say I got it. I was very excited about this recipe especially since it was not fat head dough like so many are. Cooked it in cast-iron, cooked it in the middle, heated up the pan, cooked for the full-time, let it sit for the full time, and yet it was way too doughy (beyond moist!) in the middle still. I see a lot of people have got good results but I don’t know what else to do for this. Put it back in the oven again for for 10 minutes and still not satisfied. Coming back to it the second day it definitely solidified more, but I don’t have to wait a whole day before I can use the bread in the future. I have to say the flavor was great even with the problems. Talk to me about: what coconut flour you used and what cheese you used? Depends. Sometimes I have pre-shredded and sometimes I have block cheese. I often use Cabot block cheddar. Great blog. Thank you for the awesome recipes. I’ve made this one before and it’s great. But I was wondering if I can leave the cheese out to get a more neutral bread taste?